Encryption for a backup job is configured in the advanced job settings. You should enable the encryption option and specify a password to protect data in backup files produced by the backup job. 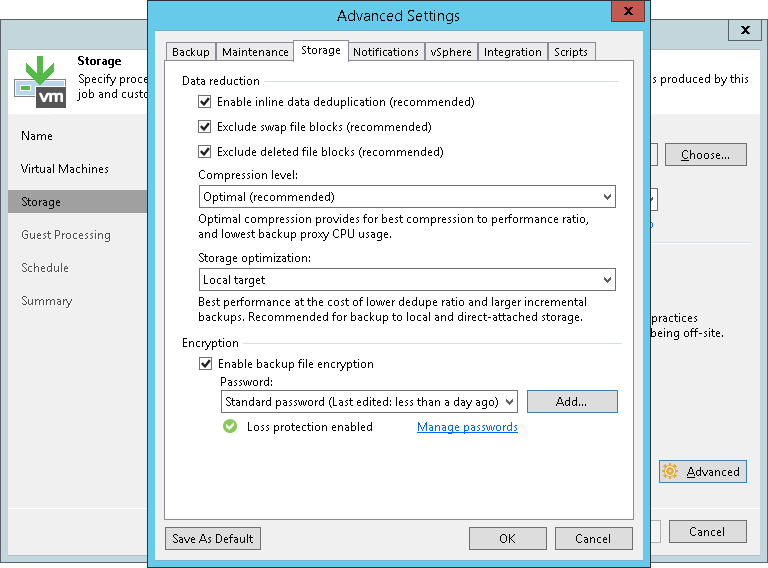 Veeam Backup & Replication generates the necessary keys to protect backup data. 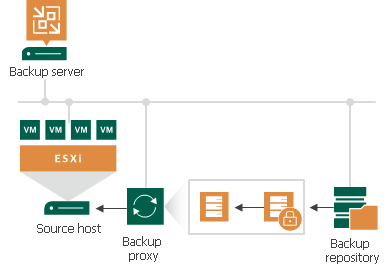 Veeam Backup & Replication encrypts data blocks on the backup proxy, either the dedicated or default one, and transfers them to the backup repository already encrypted. On the backup repository, encrypted data blocks are stored to a resulting backup file. Veeam Backup & Replication uses the provided passwords to generate user keys and unlock the subsequent keys for backup file decryption. Veeam Backup & Replication retrieves data blocks from the backup file, sends them to the source side and decrypts them on the backup proxy, either the dedicated or default one.